We have been creating beautiful smiles for more than 25 years and nurture long term patient relationships going ‘above and beyond’ what is expected. Every patient is special, every patient is an individual at Ace Braces Orthodontics, and there is no one formula used. We strive to provide excellent dental and facial aesthetics in a professional and relaxed setting. We use our expertise to provide the best smile possible through uncompromising personalised service and orthodontic excellence. Working together for more than 25 years, Dr. O’Regan and his team boast over 135 years’ service between them and with exceptionally low staff turnover are 100% committed to the team effort. Each team player contributes to the overall excellence of the practice and believes they are the ‘best’ in both their individual roles and in coming together to provide the optimum experience for each and every patient who comes to our practice. Why choose us? Refer a patient? Absolutely delighted with my new smile. I can’t recommend Ace Braces enough, the team go over and beyond from your very first visit. A friendly relaxed atmosphere with genuine people who are only delighted to help. Thank you to all. Want to say a big thanks to all the guys at Ace Braces. Had such a wonderful experience here, the staff are so professional, kind and helpful! Absolutely delighted with the outcome of my teeth. I can’t thank them enough and I would highly recommend them to anyone looking to get work done. Just had my last appointment with Ace Braces. Thank you to Kevin and all the brilliant staff! So pleased with the results! My teeth are so straight! I am delighted with the final result. I cannot help but smile! I even got my braces off earlier than expected. I would highly recommend Ace Braces to anyone looking for treatment. Thanks again Ace Braces. I just had my last orthodontic appointment yesterday,and I am so happy with my teeth. 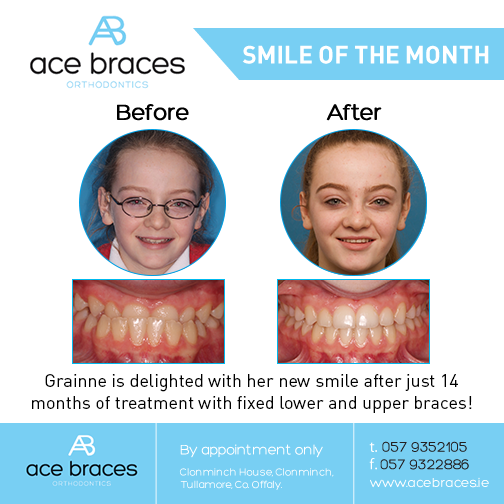 The staff at Acebraces were brilliant,they were always so kind, gentle and helpful to my sister Amy and I down through the last couple of years,we were so happy with the results that now our mam is receiving treatment there too! I would recommend acebrace to anybody inquiring about orthodontic treatment Thanks again. I’ve just had my last appointment in ace braces, I am absolutely delighted with the results, I can’t stop smiling because now I have the confidence to smile & not be embarrassed about my teeth, I can’t thank Kevin & his team enough, not only for there excellent work, also for there pleasantness, kindness & warm welcome each & every time I had my appointment, I honestly have never met nicer people. I would highly, highly recommend Kevin & his team. Our younger patients often request ‘train-tracks’, many want colours on their braces and they love our motivational ‘Best Brushing‘ monthly prizes. Our Teens enjoy having the choice of metal or clear braces, and they, with their parents, decide what brace they feel most comfortable with. Our adult patients, on the other hand, are delighted with our complete range of orthodontic treatments. Book a FREE consultation now. 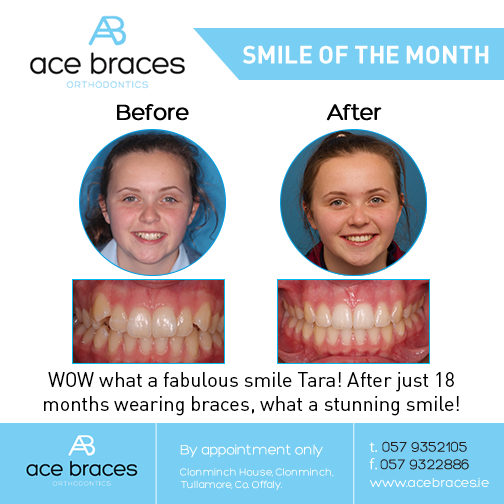 Ace Braces are specialists in clear braces. Invisalign involves wearing a practically invisible set of clear braces (aligners) provided by a specialist orthodontist in Tullamore, Ireland or in Portlaoise. They are custom molded to fit you which are changed every 10 days to move your teeth gently into the required position. Almost no one can tell you are wearing Invisalign. They are easy to wear, comfortable and virtually invisible clear braces so you can get your teeth straightened without friends realizing you are wearing braces. Ace Braces are specialists in ceramic clear braces. Ceramic or tooth coloured braces "brackets" are made of a translucent substance instead of metal so appearance wise our braces blend in and are less noticeable. Our ceramic braces are very very popular with adults and generally our ceramic clear braces are provided on the upper front six teeth so when you smile the braces are not obvious. They are often called clear braces. Braces are not just for kids but for all the family. 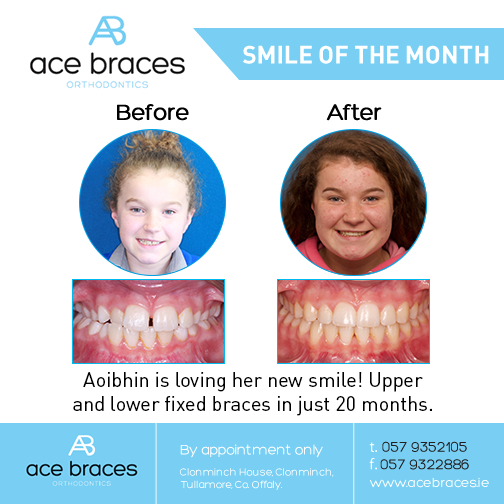 Ace Braces are specialists in fixed braces. Fixed braces can be ceramic or metal. They are glued on so there is no injection or pain. Because they are glued on, the patient cannot eat toffees or jellies which will break off the brackets. Also it takes a little longer to brush your teeth. Fixed appliances are much more powerful than removable braces and can move teeth in all three dimensions. Simple alignment may only take 6 months whereas full treatment may take 18 months to 2 years.